Kia has revised the trim levels of its smallest cars, the Picanto and Rio, in order to "make them even more appealing in an increasingly competitive UK small car market", in the company’s words. It means the trim structure of both take on a simpler feel, with the Picanto now starting at 1 Air, going through SE and on to range-topping Sport. The Rio is a four-level affair, also starting at 1 Air, to SE, to 3, to 4. 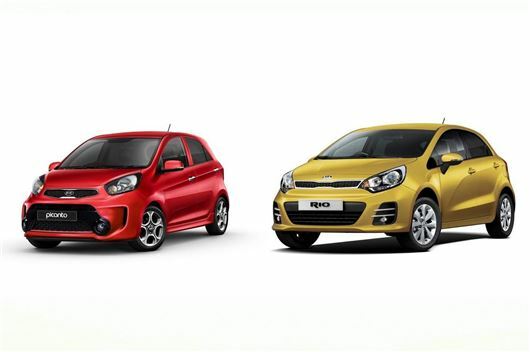 Pricing for both at the base level stays exactly the same: £8545 for the Picanto, £10,945 for the Rio. Both base cars now come with air conditioning as standard, which they didn’t before. In addition, the standard Picanto comes with Bluetooth, leather around the steering wheel rim and a height adjuster for the front seat belts. All great news for taller business users with especially sweaty palms. The Picanto SE trim replaces SR7 but adds automatic air con to the spec sheet, while Sport models get a body kit, new 15-inch alloy wheels and a choice of white, black and red paint, the last of those only available with Sport models. Inside, Sport cars get aluminium pedals and fancier interior trim including "faux leather", because "vinyl" doesn't sound as nice. The Rio too gets upgrades, with the mid-level SE (replacing SR7 spec) now as standard with automatic air con, front fogs, rain sensing wipers, cruise control and electric heated door mirrors. The 3 and 4 trim levels are as were. The engines stay the same, with the Picanto’s a choice of two petrols: 1.0-litre with 65PS and 1.25-litre with 84PS, returning average economy between 50.4mpg and 64.2mpg, depending whether you’ve got an automatic gearbox at worst or a manual with ISG stop/start at best. Prices range from £8545 to £12,595 for a Sport Automatic. The Rio has four engines: 1.1-litre, 1.25-litre and 1.4-litre petrols, and a 1.4-litre CRDi diesel, that one returning 98g/km and 74.3mpg. Petrol efficiency ranges from averages of 44.8mpg to 78.5mpg, again depending on whether yours has a manual, an auto and is fitted with stop/start. Rio prices start at £10,945 and top out at £17,445 for a 1.4-litre diesel manual. Click here to rear our review of the Kia Picanto. And here for the Rio.